Summertime… and the livin’ is all outdoors! Families, couples, groups of friends, take note: Indiana’s Cool North is your place to be for a quick getaway or extended vacation. Think affordable, easy to get to, and, most of all, FUN! Want to dive into a Great Lake? Conquer a giant sand dune? Paddle a lazy river, pedal serene countryside, drop a fishing line, or tee off on a classy course? Your adventure awaits! Northern Indiana meets Lake Michigan in a sun-kissed landscape of undulating sand dunes and glorious blue waters, both seeming to go on forever. Michigan City serves as the unofficial gateway to The Indiana Dunes National Park, which stretches across a two-county region. The Indiana Dunes State Park in Porter is a great place to get advice on a host of adventures. Up for a test of your outdoor strength? Take “The 3 Dune Challenge,” a tough trek running or hiking a 1.5-mile course on the State Park’s three tallest dunes. Most climbers find the steep, sandy slopes take them backwards as often as forward. But there are plenty of gentle hiking options too among the dunes, with 16 miles of hiking trails in the State Park alone. Washington Park in Michigan City reigns as the Grand Dame of the shore. 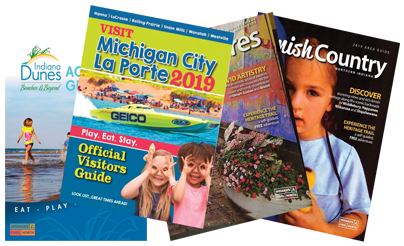 You can easily spend a whole day swimming, sunning and playing on the expansive beach, picnicking in the shady park, seeing Indiana’s only working lighthouse, and visiting all those wonderful creatures right next door at the Washington Park Zoo. To the west, dog-friendly Central Beach offers a quieter experience, and Mt. Baldy Beach is backed by the National Park’s largest moving dune. There are several more public beaches in the two-county area. Every angler on earth dreams of reeling in a prize catch, and the waters of Lake Michigan offer some of the best Coho and Chinook salmon fishing around. 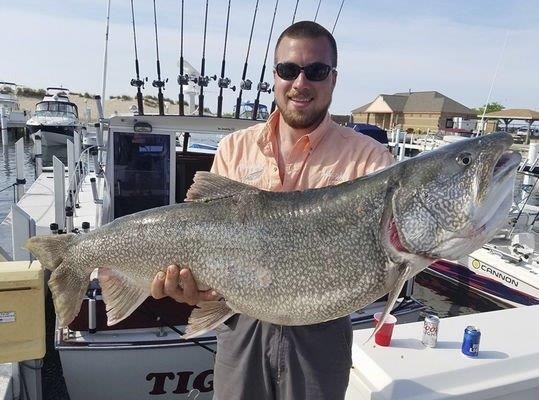 There’s a reason Michigan City is known as the “Coho Capital of the World.” It’s easy to get out on the water for the fishing adventure of a lifetime with one of Michigan City’s professional charter boat captains. There’s more to the Indiana Dunes than lakeshore and sand. Get some maps at the State Park in Porter and you’re off on trails where you’ll discover peaceful woodlands, rivers and wetlands, all rich with birds and wildlife. In fact, birdwatchers in the know flock to the area, a haven for numerous species of birds. Head off on your own or take a ranger-led hike. Have bikes – will travel! That’s certainly the rule for so many families and groups these days who wouldn’t dream of leaving home without the bike racks filled. A host of trails, ranging from easy to challenging, make Northern Indiana a quick escape for a biking adventure. And the scenery is breathtaking to boot! Here are a couple of intriguing options that cyclists love. Take a lovely green countryside, add an up-close look at Amish life, top it off with a bit of railroad history and you have the makings of a unique adventure on this easy-going 17-mile route. It was a popular passenger and mail service train route in the early 1900s, nicknamed “pumpkin vine” because of its numerous curves and turns. 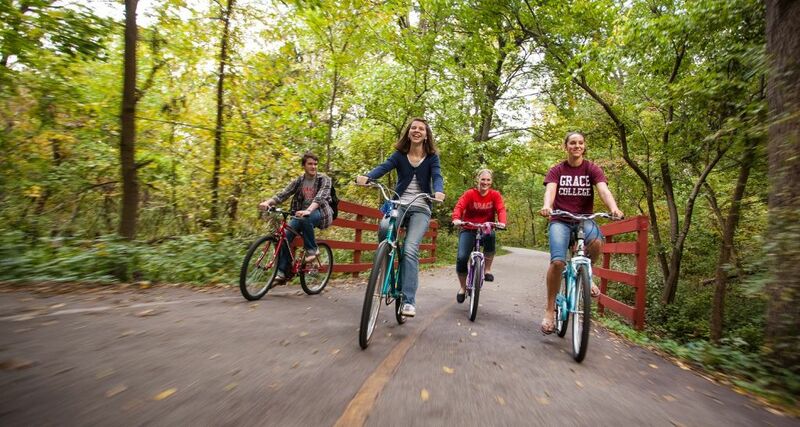 Today, bicyclists delight in that characteristic of the Pumpkinvine Nature Trail that begins in Goshen and travels through Middlebury on to Shipshewana, all in the area of Indiana’s largest Amish community. Along the way, you’ll see the signature white Amish farmsteads, where fields are tended with horse-drawn equipment, and hand-washed clothing and quilts flap on clotheslines. Signage reveals the railroad’s history as you traverse a primarily paved pathway suitable for all ages. The trail also connects with other trails that lead to Elkhart. If mountain biking is your pleasure, the dips and dives of this 9.7-mile single-track trail near the community of Winona Lake are sure to challenge you. Uphill climbs, quick descents, and jumps galore combine with flat stretches for an ever-changing course. You’ll zoom through scenic forests and may spot wildlife such as deer, chipmunks and squirrels. Riders praise the trail’s jumps and technical challenges. It crosses two creeks and is located on 150 wooded acres. You might be surprised to learn that a two-county area in Northern Indiana well-known as an Amish enclave also boasts several rivers just made for easy-going canoeing and kayaking adventures. Outfitters provide everything you need, including your craft and transportation to your departure point. Envision a getaway on calm, cool waters that meander through surprising wilderness areas. Then plan your adventure on one of these rivers. Amazingly clear waters and banks lined with trees and marshes draw paddlers to this stream, relatively unchanged since the Potawatomi tribe traversed its waters hundreds of years ago. Wildlife abounds and there’s a good chance of seeing deer, geese, ducks, heron and more, especially early or late in the day. You can plan your trip and rent your canoe or kayak through T & L Country Canoes in Shipshewana. The company also has a picnic area with barbecue grills and sells hot dogs, burger, and buns so you can feast when you return. Even the otters know this river near the town of Mongo is a great place to play, and you may spot some along the way, as well as beaver and osprey. The clear waters of this gentle stream with its rocky and sandy bottom also invite a swim, fishing for trout, and lunch on the banks. Plan your excursion with The Trading Post. They offer six river trip options ranging from a few hours to several days. You can also spend the night at their campgrounds. If you have your own canoe or kayak, paddlers recommend the Elkhart River between Elkhart and Goshen. The stream alternates between rural tranquility and a more urban vibe. You may see lots of wildlife, such as deer, heron, duck and geese along some stretches, and people who may shout a friendly hello along others. You can launch from Rogers, Oxbow or Studebaker parks. Easy paddles down the flowing waters of this river are even more fun if you bring your cooler and beach on the the sand bars and islands along the way for lunch, a little sunbathing and maybe a cooling dip. The river runs through mainly wilderness terrain, though houses dot the banks here and there. 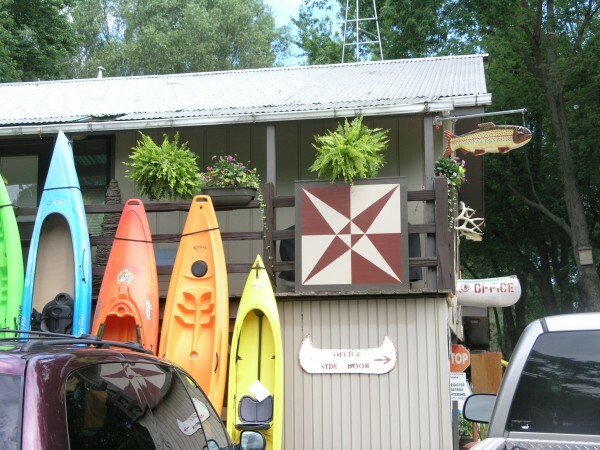 Aqua Bound Canoe and Kayak Rental in Bristol will get you set up for weekend and holiday trips that range from 2½ to 4 hours. Whether you’re a seasoned player or still in the learning mode, The Golf Club at Swan Lake provides a dream golfer’s getaway. The home of the United States Golf Academy, the resort features two 18-hole championship courses. The Silver Course provides a shorter, more strategic layout for all levels of play, while the Black Course provides a championship experience. PGA pros are available to help you improve your game. And it all comes with a full-service resort where the non-golfers in your party can find plenty to do. Did you ever dream of hitting the Pete Dye Trail? This compilation of seven Indiana courses designed by the legendary course architect includes the Mystic Hills Golf Club in Culver. The stunning 18-hole course incorporates a links style design on the front nine and a more traditional feel on the back nine. Prairie grasses guard the fairways as numerous sand bunkers protect each green. 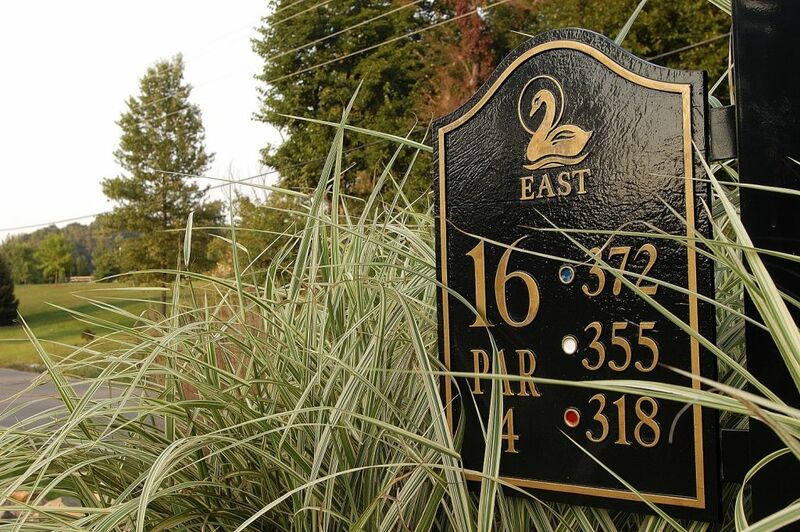 The course offers you views of wetland areas, lush woods and rolling fairways. You also can book a “Stay and Play” cabin, new lodgings next to the course. Morning sounds signal another perfect day at the lake… waves lap the shore, motors purr as fishermen head out, and bare feet slap the dock before that iconic splash in the water. Northern Indiana abounds with glistening inland waters and plenty of beaches, marinas and resorts large and small. Your lake escape is just around the corner. Indiana’s second largest inland lake, affectionately known as “Lake Max,” delights vacationers with every kind of water activity in the small resort town of Culver, often called “The Cape Cod of the Midwest.” Visitors enjoy swimming, waterskiing, boating, fishing and more adventurous endeavors like parasailing, wakeboarding and wake surfing. There’s a pristine public beach, and marinas rent kayaks, pontoons, fishing boats and more. Resorts and individual cottage rentals are available. It seems nearly every community in this corner of Indiana’s Cool North claims a lake or two. 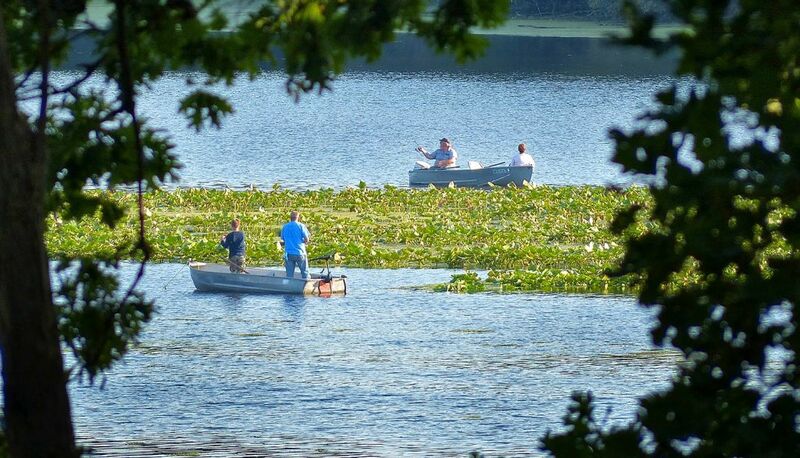 In fact, Kosciusko County is home to more than 100 lakes, so visitors have plenty of choices for swimming, fishing, sailing, leisurely pontoon rides and even tour boat rides. And this region is less than two hours from Chicago! Lake Wawasee in Syracuse takes the title as Indiana’s largest natural inland lake and is also home to Oakwood Resort, a popular full-service vacation getaway on the water. Some vacationers opt for cozy cabins and cottages like Dixie Haven Resort on Webster Lake in North Webster or others on Winona Lake, Little Barbee Lake, Tippecanoe Lake and more. The community of Warsaw is known as the “City of Lakes,” with four lakes within its city limits and plenty of parks to go with them. Who would have thought outdoor adventures await right in the city of South Bend? And best of all, you can opt for an invigorating experience on the spur of the moment without bringing any of your own equipment along. Steep drops… big splashes,,, twists, turns, and conquering the rapids! All the exhilaration of white water rafting is yours in downtown South Bend on the first manmade white water rafting course built in North America. Before that, the east race of the St. Joseph River generated power for local companies. Today it produces Class 2 Rapids that more than 400,000 people have ridden. Some have even been thrown into the water, but say it’s all part of the fun. Walkways along the 1,900-foot course allow family and friends to cheer you on. The waterway is open Saturdays June through August. Longing to cycle through the city and parks, but didn’t bring your bike along? 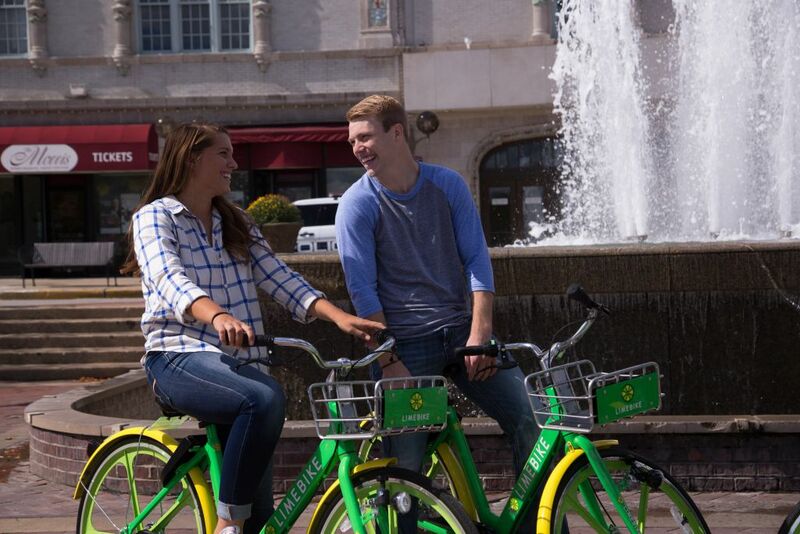 With South Bend’s new Lime Bike bike sharing program, you can ride all over the place. The program gives cyclists a chance to check out one of the 2,000 lime-colored bikes parked all over town using a mobile app. You pay only $1 per half hour. Once you are finished riding, simply park the bicycle at any bike rack or along any sidewalk and lock the back wheel. If you’re looking for a great ride, don’t miss neighboring Mishawaka’s Riverwalk, a circular system of bicycle/pedestrian trails on both banks of the St. Joseph River with connecting bridges. Beautiful landscaping highlights the pathway.